United Airlines has received a hefty penalty for keeping passengers waiting on airplanes for hours on end while their flights were delayed. The Department of Transportation fined the carrier $1.1 million-the biggest fine of its kind so far-for tarmac delays that happened at Chicago’s O’Hare Airport last year. 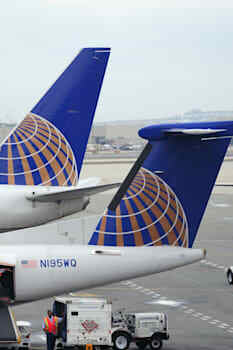 Rules that were put in place in 2010 state that airlines will be penalized if they keep passengers waiting around on the tarmac for more than three hours. In United’s case, all the rule breaking happened on one particularly stormy day when 13 separate United flights were delayed because of thunder and lighting. According to the rules, United was meant to give passengers the chance to get off the plane as it was obvious flights would be held up. But the carrier didn’t. And to top it off, bathrooms on the some of the delayed planes weren’t working, leaving passengers in the lurch.The Department of Transportation says United didn’t do a very good job handling the situation and didn’t reach out to other airport personnel for help. The Department of Transportation also slammed the airline for not having a good plan in place to deal with weather-related problems in general. Some of the money from the fine will go to passengers affected by the delays, while another portion will go towards creating a tracking system at O’Hare so United can better monitor its planes. Sleeping in rickety old beds, eating bland food that you’re forced to cook yourself and being bossed around by hotel staff hardly sounds like a fun travel experience, but tourists in Germany are paying $150 a night for exactly that. It’s all a part of a unique experience that gives travelers the chance to experience life as it was for soldiers in East Germany. Visitors are taken to a forest 200 miles outside of Berlin where they spend the night in the Bunker Museum, which as the name implies, is a former military bunker. The bunker was built more than 40 years ago for use by the German secret police, and was designed to become a military command center if the local area was ever attacked.Today, tourists can experience life in the bunker, which includes donning the soldier’s uniforms before peeling potatoes and cooking sausages for dinner. But don’t expect a good night’s sleep here-the bunk beds are small and uncomfortable with thin mattresses and, naturally, you’re expected to make the bed yourself. Those who run the hotel say the experience has proven extremely popular among travelers, and quite a few of those who visit are actually former East German residents themselves.